This was a fun outdoor play activity that we did this week. It didn't turn out like I was thinking in my mind, but it was pretty cool to explore and we did have (messy) fun with it! We started with washable finger paints in little cups and added some sand from the sand box. Mix the sand into the paints until you get a nice crumbly texture. This is a great task for bilateral hand coordination. The kids use their non-dominant hand to hold the cup and their dominant hand to stir. 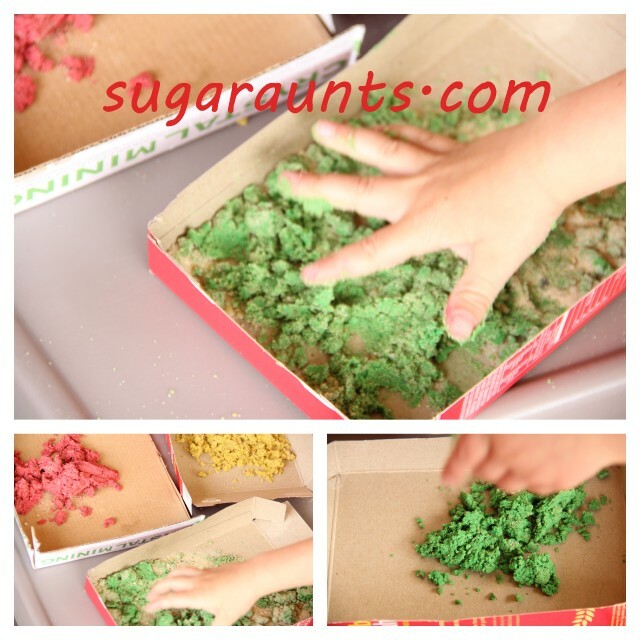 We poured the crumbly textured paint onto cardboard and played. This was so neat to press, roll, squeeze into a lump, squash, and crumble up again. We played with this for a long time. So, here's where my idea derailed...I was thinking we would let the sand dry and it would crumble up into colored sand. It did dry when we left the sand out overnight...but it was not sandy and fine. The dried mixture was sort of lumpy and hard. Still fun and neat to mix in with plain sand, but not what I had in mind. That was when we went back to the drawing board and came up with this idea to make colored sand...it worked much better to get the sandy texture we were hoping for!